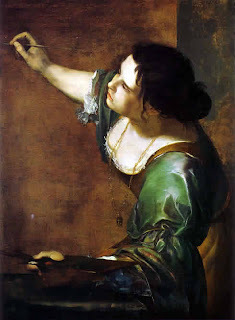 She began painting as a teenager (she painted Susanna and the Elders, which I've posted below, when she was 17). Her life-story is pretty rocky: she was raped by her tutor, the painter Agostino Tassi, and subjected to an extensive and very public trial (during which she was tortured while being questioned in order to "verify" her accusations). A compelling (if questionably accurate) film was made about Artemisia's life in 1997; it's called, simply, Artemisia. 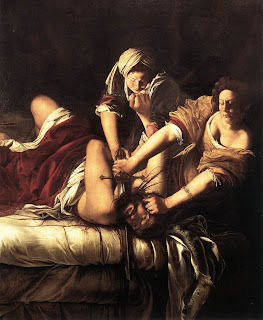 For more information, check out Mary D. Garrad's book Artemisia Gentileschi . 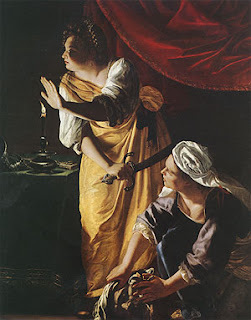 I absolutely adore Artemisia Gentileschi's work--always have; her use of chiaroscuro (contrasting light and dark) is nothing short of brilliant and her paintings radiate a confident and beautiful style that's really quite unique.